The daily newspaper Prameya, published from Bhubaneswar, has made a mountain out of a molehill in eagerness to do which, it has contravened journalistic ethics that prohibit innuendoes against any woman. The victim of its innuendoes is a lady member of Orissa Legislative Assembly Ms. Rajashree Mallick of the ruling BJD from Jagatsinghpur. A Neem tree (Azadirachta Indica) selected as Daru (wooden log) for Nava Kalevar of SriJagannatha in the constituency of Ms. Mallick had attracted thousands of believers to the spot. Excise Minister of Orissa, Dr. Damodar Raut hailing from the same district was one of the visitors. Coincidentally Ms. Mallick had been to the spot at the same time. 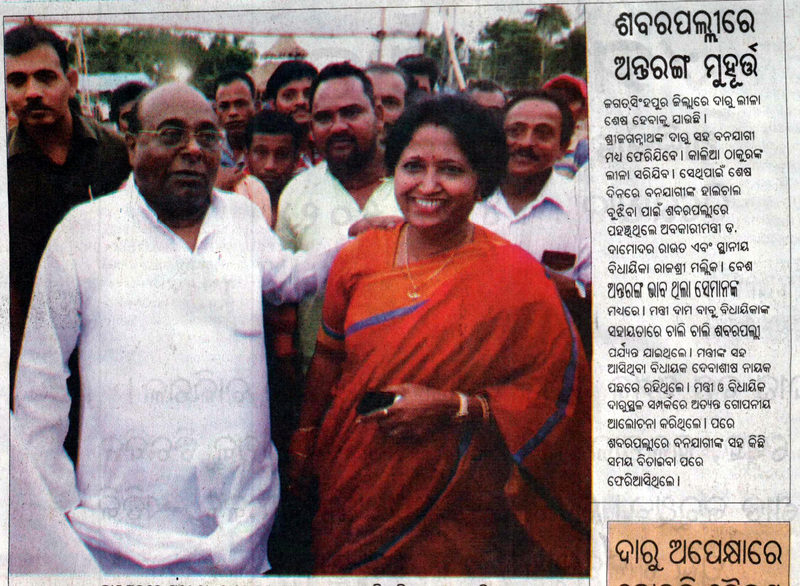 Both of them together in company of many visitors proceeded to the spot and Prameya had photographed them. The information was not of any public importance, and, who were visiting the spot was not engaging media or mass mind. The issue of public importance was the Daru and the deliberate rituals going on there in contravention of norms that controls the choice of the Daru. Settled norms stipulate that if any bird would be having its nest in any of the branches of the tree, that tree must not be selected for building the new idol of Jagannatha. On this particular tree, an owl family was having its nest. The false and concocted legend of the so-called Daru was identified on the basis of dreams was certainly not matching the norms. The media had a responsibility to explain the phenomenon to the people keeping in mind the emphasis of the Constitution of India on ‘scientific tenor’ in matter of such religious activities. When Prameya has shown no interest to handle the Daru issue, it has preferred to highlight the picture of the Minister and the lady MLA moving towards the Daru with a hand of the Minister put on the shoulder of the MLA captioning the same as “moment of intimacy”. The body of the story emphasizes that there was discernible deep intimacy between them both and they were engaged in “very secret discussion” on the spot of the Daru. Innuendoes are innuendoes. They cause damage, might be inadvertently, and always make mountains out of molehills. Therefore, Ethics of Journalism never countenances any presentation that is pregnant with elements to generate any innuendo against any woman or against whosoever has no sharpness to instantly grasp the tricks detractors play through pet media houses. Journalism is the only profession that needs to cleanse itself from within, but there is no mechanism for that. The Prameya picture with the report dated May 14 is put here for records. Neem tree is symbol of Kali. Kali consumed Raktabija, similarly neem destroys virus. In a sense, Jagannath is called Dakshina-Kali. First chapter of Chandi path tells sleeping form as Vishnu and awakened form as Jagannath when Yoganidra leaves his body. Use of neem tree for idol is symbolic for life cycle and its preservation. In old calender of Karttikeya of 15800 BC, 1 yuga was of 19 years, later on called Metonic cycle in Sumeria. This has been adapted in current Indian calender as extra Ashadh month. Only those neem trees are selected which develop deformity, called signs of Devas. That is in decaying stage and fit for cutting. Too much meaning and vague dreams should not be attached to this. All the thanks, dear esteemed Arun babu ffor the enlightening input. Who actually wanted the Caption to be like that ……….. need to be investigated i.e. was it the reporter’s / editor OR the Management. The pic looks to be so innocent and timely-pious amongst hundreds of devotees around. A stale mind can only frame a cap like that …….. Thanks to orissamatters to have brought such a ‘not so significant’ yet a matter of grave consequence to an individual visa-vs the society at large.